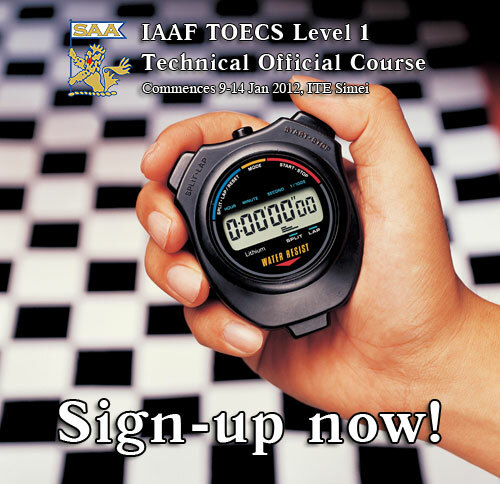 The Singapore Athletic Association is now inviting members of the public (with athletics experience) to sign-up for the TOECS Level 1 course, to be held from 9th January 2012 to 14th January 2012, daily course starting at 7pm (except on saturday at 2pm). Venue, ITE Simei. Download the below application form, and send it to SAA. Candidates must fulfill the following criteria before being accepted on a TOECS Level I Course. Candidates must be physically fit for their assigned role. This does not exclude individuals with disabilities from participating on courses. COST FEE: S$120-00 (Participants will be issued a IAAF Competition Rules Book 2012/2013 & stationery plus 0ne Tea-Break). For student under the age of 18 (as at 31-12-2012) = S$80-00. PAYMENT: By cheque payment make up to SINGAPORE ATHLETIC ASSOCIATION. Note: The course will only commence if a minimum 15 participants registered. Maximum number of participants 30.